The 'Ricky' bass sound graces many a classic track. Have Scarbee nailed its distinctive qualities? I can't deny a frisson of eager anticipation whenever Native Instruments release a virtual instrument with the Scarbee branding. Scarbee have already produced three excellent virtual bass guitars: J-Bass, Pre-Bass and MM-Bass (Jazz, Precision and Music Man). All are eminently playable, extremely expressive and uncannily realistic. These particular models of bass often crop up in sample libraries and virtual instruments, though for some reason the Rickenbacker is a comparative rarity. Rickies have provided the signature sound of bassists across a hugely diverse range of musical styles, from Bruce Foxton of the Jam to Chris Squire of Yes; their throaty, almost guitar-like tone is instantly recognisable, and remains the definitive bass sound for many progressive rock bassists. It was only a matter of time before someone would redress the balance, and as a fully paid-up prog rocker, I couldn't be more pleased that Scarbee have risen to the challenge. 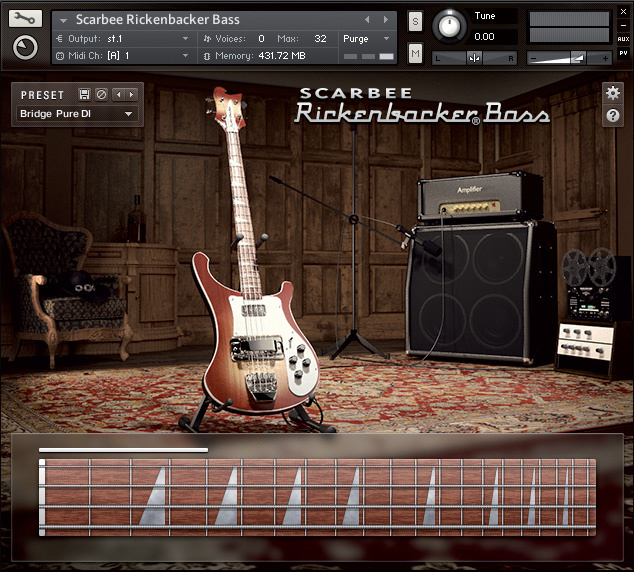 Scarbee's Rickenbacker Bass (SRB) expands on their existing virtual basses with a posh new GUI, built-in effects, and some welcome improvements to the KSP scripting. It's the first Scarbee bass to have been played with a pick rather than fingers, so it's tonally very different to their previous bass products. The model sampled for SRB was a 4003, with Rotosound Swing Bass 66 round-wound strings providing that characteristic 'Ricky' wiry top end. SRB is provided as two separate .nki instruments in two flavours, Palm Muted and undamped. The Palm Mute instrument simulates the effect of using the damper bar on the tailpiece of the original bass, (removed by the majority of Ricky players!) and favoured by country and western players. Although muted, the sound still has plenty of body and sustain, with a pronounced pick attack. A good example is Paul McCartney's bass sound on 'Lucy In The Sky With Diamonds'— this was reputedly a damped Ricky 4001 with flat-wound strings. Conversely, the undamped Rickenbacker Bass lets rip with unrestrained gutsy power, long sustain, a rich low end and tons of high-, mid- and top-end detail, enabling SRB to cut effortlessly through the densest of heavy rock mixes. Like Scarbee's other basses, SRB uses KSP scripting to take care of string selection and up/down strokes automatically. But if SRB's 'intelligent' choices aren't to your taste, they can be manually overridden at any time via non-latching keyswitches. So, for example, if you'd prefer that open G to be played on the A string with an upward stroke, it can be forced to do so. While the most frequently used articulations (sustain, hammer-on, pull-off, grace notes) are available directly from the playable keys, additional keyswitched articulations, such as trills, buzz trills, mutes and pickup claps, are also provided. The scripting for trills and buzz trills has been considerably improved from previous Scarbee basses, which offered only short trills of preset speed and length. On SRB, the player can now perform trills and buzz trills at their own speed, for as long as desired. A 'Force Hammer-on/off' keyswitch also enables hammer-ons, normally invoked by overlapping two notes a semitone or tone apart, to be 'forced' across much wider intervals, as long as they're within the range of the currently playing string. SRB can play polyphonically up to four notes (obviously! ), but the Sustain keyswitch renders SRB monophonic, and simultaneously functions like a traditional sustain pedal, useful for keeping repetitive eighth-notes sounding 'connected'. The sustain pedal itself (CC64) is used in conjunction with consecutive overlapping notes to produce legato string slides: an essential articulation for creating the illusion of a real bass. The legato slides were sampled at three speeds, the choice of which is determined by the key velocity. This composite screen shot shows all SRB's control panels, in order of signal flow. SRB's neck and bridge pickup selector, volume and tone controls alone provide a dramatic range of tonal variations, from full treble proggy excess to warm, dub-style plumpness. Either or both pickups can be selected, and, true to the original instrument, a 'Rick-O-Sound' switch engages both pickups, panning the bridge pickup hard right and the neck pickup hard left. 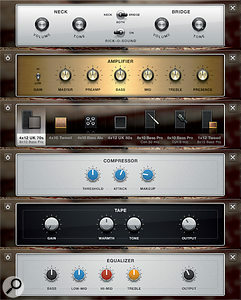 Some Rickenbacker players use this facility to process the sound of each pickup through separate amps, and SRB makes the same practice possible in a DAW environment. In a departure from previous Scarbee basses, SRB takes advantage of Kontakt 5's suite of effects to further shape the sound. 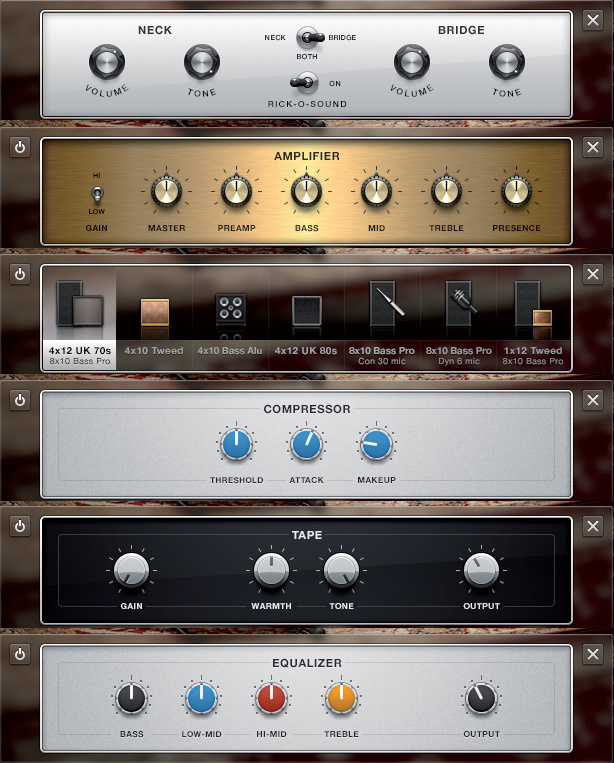 On offer are an amp simulator (Kontakt 5's new Jump model), a choice of seven cabinets, tape saturation, and the SSL-modelled compressor and equaliser. The GUI for the compressor and equaliser offer a reduced set of controls: attack, threshold and makeup gain for the compressor, and four fixed frequency bands for the EQ. However, there's nothing to stop you going 'under the hood' and tweaking the full range of parameters for those effects if you feel the urge! Each effect is individually switchable, and all pickup and effect knobs and switches, including each effect's on/off status, can be assigned MIDI controllers via the usual 'MIDI Learn' procedure. SRB includes its own integral preset library. Both the undamped and palm-muted instruments share identical sets of 25 factory presets that ably demonstrate the sonic range this instrument can produce with no external plug-in assistance. The benefit of both instruments sharing a common library is that tonal consistency is assured if you have undamped and palm-muted versions loaded together and wish to feature both playing styles in the same piece. Users can, of course, save their own presets, and for the reason I've just mentioned, a preset copy function would have been handy for transferring user presets from one instrument type to the other. If a sampled bass can capture the imagination and provide hours of pleasure through simply being played on its own, it must have something going for it. SRB is very easy to get to grips with and a real delight to play. The sound can be best described as having the joy and playfulness of a bouncing ball; it drives a track along with great authority and its tone seems to fill the frequency spectrum, yet it has the magical ability to leave other instruments in the mix plenty of room to breathe. It sits proudly, but never clouds the picture. Scarbee's tried and trusted implementation is further enhanced by the built-in effects, obviating the need for external plug-ins to sculpt the sound, although that option is always open to you and, indeed, a good bass-amp simulator extends the sonic possibilities even further. I wish there was space here to describe SRB's other minutiae, such as the release samples, controllable neck position, fret noises, scrape offsets and round robins. Nevertheless, I look forward with eager anticipation to Scarbee's next product; personally, I'd vote for a Rickenbacker electric 12-string. Superbly crafted and carefully sampled, with first-class sound quality. The instrument is capable of producing a vast range of tones with no external plug-in help. In my opinion — none! Scarbee's Rickenbacker Bass is expressive, a doddle to use, sounds highly realistic and sits effortlessly in a mix. It's especially well suited to rock and pop styles, lending them authority and drive. Native Instruments +49 30 6110 350.